Joy joined the club in 2002 and remained a member until 2005 when she moved to live in Wellington. She was granted Honorary Membership and remained so until 2007 when it became apparent that she would not return to Marlborough to live. Joy has the improvement of women’s position in our society at heart and through her membership of Zonta Club at the time, was able to give energy to Zonta’s causes and enjoy the fellowship of like minded women. Joy willingly gave her time in a fundraising weekend which invited interested people to join her in a writers workshop seminar. It attracted many budding writers and was a great success for the Club. When finances of the Club had dwindled to a very low level and an urgent restructuring of processes for the Treasurer was needed, Joy came to the rescue. She donated the royalties from her latest children’s book with “no strings attached” which effectively gave the club a $5000 administration boost. In time, after prudent financial management and the club returning to “the black” that sum was put into a fixed deposit account with the Bank to be a contingency fund and so it remains. Club members when talking through finances at AGM’s etc, still refer this as “Joy’s” money! We have been pleased to support the cause of Literacy Marlborough, and English Language Partners which reflects Joy’s far reaching influence on our Club. In completing courses that gave literacy and numeracy to those women who had missed out in their education, or to migrant women who struggled to learn English, their lives improved exponentially. 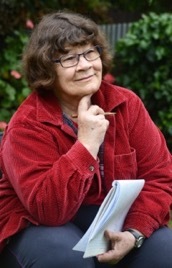 In 2012, Joy Cowley accepted the Club’s invitation to come to Marlborough as guest speaker at the International Women’s Day brunch to be held on 9th March. It was a sell out event, and Joy’s perceptive and entertaining speech was thoroughly enjoyed by all present.